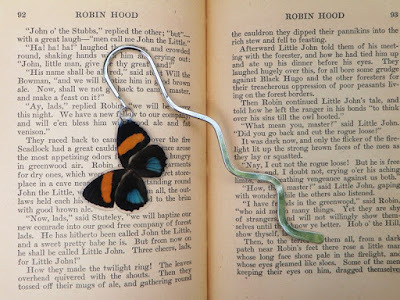 I came across this interesting post by Zell Lee over on Resin Obsession which shows how you can make real butterfly wing resin jewelry or charms such as this one for a bookmark. 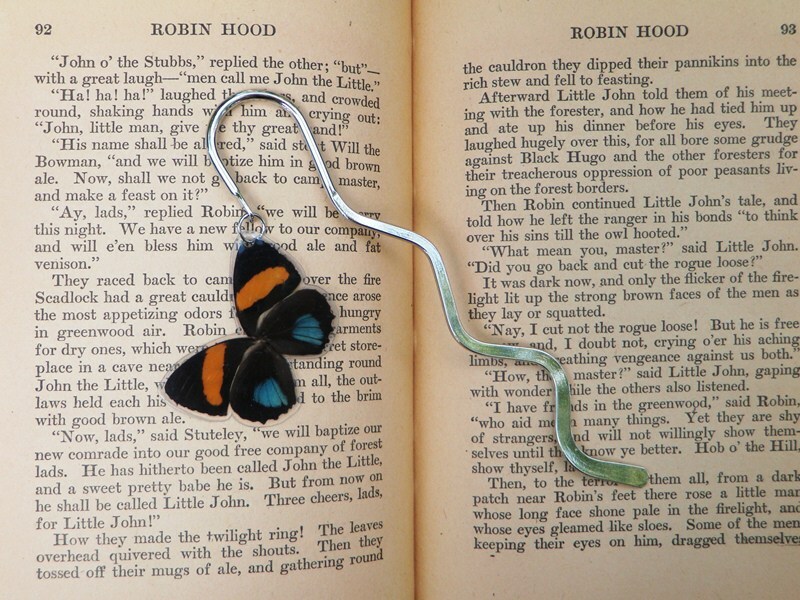 Most butterfly wing jewelry makers sandwich them between glass which is then soldered around the edges. That is because butterfly wings are incredibly fragile. You cannot glue them either as it will affect the wing colors. So I liked Zell's solution which is to laminate them first before doming with resin. Her way makes it fun as you can cut the laminated wings in many different shapes. You can also glue the laminated pieces into metal bezels if you prefer. No soldering needed! Please do not catch wild butterflies and kill them. Many species are already in decline with habitat losses and possibly other causes. But if you find dead ones in say your greenhouse or garden, then go ahead! I have planted several butterfly attracting plants in my garden - buddleia or butterfly bush, purple cone flowers and salvias. There are many other plants to consider. There are also butterfly breeding farms and conservatories where you could perhaps source wings from dead butterflies. And there are pros and cons with such commercial industries. David Anderson who commented on that tutorial post had this to say : "They are farmed and must be euthanized immediately upon setting their wings to produce an A1 specimen. A few morphos are net caught wild, which the seller will indicate. But most Papilio and Morphos are farmed. Consider this, no forest, no butterflies. Collecting and farming does not extinguish butterfly species, habitat destruction does. A commodity harvested from the forest gives financial incentive to the indigenous persons to conserve the tropical forest intact. Caterpillars at farms need lots of host plants, those come from the forest. Farming butterflies helps to conserve butterflies. All humans have a vocation for sustenance. If a person earns money from a protected forest through butterflies, that is a protected forest that won’t be clear cut. Yes, farmed butterflies are euthanized without experiencing a full life. But the forest that supports farmed butterflies also supports butterflies that fly naturally free." Anything that involves butterflies is a Catch 22 isn't it? They are so incredibly beautiful. I'm waiting for someone to make fake butterfly wings for our use. That's clever! And the result is beautiful!